Conor McPherson’s play The Weir finds the playwright in a contemplative mood as he deals with themes of memory and myth, life and death, light and dark. On its première in 1997 the drama won the Evening Standard, Critics’ Circle and Olivier Award for Best New Play, and established Conor McPherson’s eerie tale as a masterpiece of modern theatre. Set in a pub in sparsely populated Co Leitrim on a dark, windswept night, the play interrogates the value of myth-making, story telling and the allure of the supernatural in today’s sceptical world. It features stoical barman Brendan, wise-cracking garage-owner Jack, shy handyman Jim and show-off businessman Finbar who all meet regularly in the pub to sup pints. As the group exchange stories a beautiful and enigmatic woman named Valerie arrives causing a gear-shift as the punters try to impress her with tall tales of faeries and ghostly apparitions. Valerie, here played by Belfast actress Kerri Quinn, becomes increasingly absorbed in their stories and proceeds to deliver a public confessional about the death of her child. 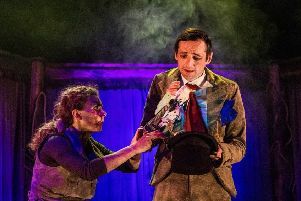 The Weir moves deftly from pub banter to something closer to Edgar Allan Poe’s tales of the supernatural and this production at the Lyric Theatre directed by Andrew Flynn carefully unpacks the complexity of McPherson’s script. The new production by Decadent Theatre marks the first major Irish revival and national tour of The Weir, rebooting its haunting storyline of spectres and lost souls. Mixing barstool banter and tales of faeries the ensemble cast - which also features Frankie McCafferty, Garrett Keogh, Patrick Ryan and Marty Maguire - engage in that most Irish of occupations - sharing imaginative flights of fancy over a few drinks. “All the action takes place in a very isolated community somewhere between Sligo and Leitrim,” explains Andrew. “This is set during a time when the area had been hit very significantly by immigration. On this particular night rumours abound that a young woman will arrive from Dublin. Among the men bantering in the pub this is an immense source of curiosity. They are local men who drink in this pub every night and now they are waiting for this enigmatic stranger to arrive. Andrew is particularly enthused by the brilliance of McPherson’s writing which manages to find dynamism in word power rather than physical movement on stage; some of the characters don’t leave their bar stool over the course of the action. In its depiction of story telling and rural pub talk The Weir says much about the particularities of the Irish psyche. The Weir, which McPherson penned at the age of 25, opened at the Royal Court before transferring to the West End and Broadway. Here the playwright has managed to charge a confined and static situation in a bar with the dynamism of his characterisation and word play. These elegant dramatic exchanges hinges on the playwright’s spare, stellar and impressionistic writing. “This is an intimate and naturalistic play,” adds Andrew. “It’s about relationships, it’s about humanity, it’s very funny as well as eerie and the stories that each of the characters tell are just so well crafted that they completely reel the audience in. It touches on rural isolation - three of the men are bachelors and the play ponders their loneliness as well as friendship. The Weir by Conor McPherson runs at the Lyric Theatre, Belfast until September 30. Visit www.lyrictheatre.co.uk/ or call the box office on 02890 381 081.